1. His return coincided with daughter's departure. 2. He's an excellent, innovative cook. We spend hours planning menus with simple fresh ingredients, and sometimes he even cooks lunch after a session in the gym. 3. He knows when I want (read 'need') a drink. He knows which wines I like, usually Sauvignon Blanc, and that it needs to be nicely chilled and poured into my favourite, large glass. 4. He has definite opinions about everything from politics to literature to fashion and can argue his case intelligently until the cows come home (and does...). 5. He's got a wicked sense of humour. 6. Best of all, we never tire of his company as he leaves us for weeks on end to 'be a social butterfly' or to be with his girlfriend in Oxford. 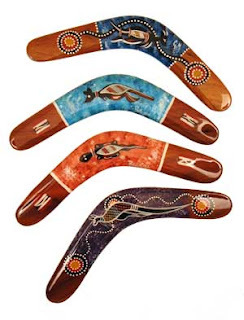 A perfect boomerang. I have a son like that, but I must admit the other two are a LOT more work! Glad he'll be "underfoot" for a while to help you get past your daughter leaving.